MERRITT ISLAND, Florida -- NASA's space shuttles flew their final missions in 2011, finishing each with a touchdown on the Shuttle Landing Facility (SLF) runway at Kennedy Space Center in Florida. Permanent reminders now mark where Discovery, Endeavour and Atlantis each rolled to a final stop. Etchings in the grooved concrete along the runway's centerline reveal where the shuttles' nose gears came to rest as the Space Shuttle Program came to an end. Alongside the runway, newly installed black granite markers offer more information about those final flights. "The Shuttle Landing Facility is a location with a very rich history, so we decided to come up with a way to preserve that history, and do it in a way that would last for a very long time," said NASA Test Director Mike Ciannilli. The idea for a permanent marker at the runway was first proposed in early 2011. The project team quickly came up with concepts and began the process of accomplishing the work. "One of the concerns we had is that as time goes on, you start losing the desire to preserve your history," Ciannilli said. "So we really wanted to move pretty quickly and make sure we could get this project done." Local artist Chad Stout, owner of C Spray Glass Blasting in Cocoa, Fla., was selected to design, manufacture and install the etchings and granite pavers. While NASA had specific requirements for the project, Stout was encouraged to propose his own ideas regarding the design of the markers. The centerline etchings are simple, with small block letters bearing the mission number and the words "final wheel stop." 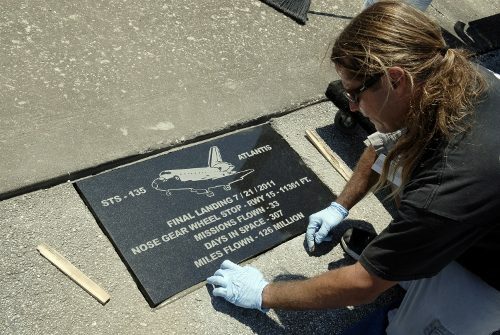 The polished, black granite pavers feature a carved silhouette of a landing shuttle, its landing gear deployed, along with the mission number, landing date, and facts about the spacecraft. "(Stout) first came out and pitched his idea of what he was able to do. It sounded really good, but when we saw the final work, I was really impressed," Ciannilli said. According to Tom Friers, NASA's chief of Flight Operations at Kennedy, the Landing Operations Team marked the runway with spray paint after each landing. Those markings, along with measurements taken on landing day, were used to determine exactly where to place the etchings, which Stout cut and then painted with long-lasting, black enamel paint. The small carvings in the concrete are safe for any vehicles using the runway, an important consideration for the spaceport. "The centerline markings are no different than the standard grooves on the runway, with no impact to a landing aircraft or space vehicle," Friers explained. Easier to see than the etchings, the larger pavers are 2.5-inch-thick slabs of "Absolute Black" granite, an extremely durable variety of the stone. Weighing at least 100 pounds each, the granite markers are aligned with the centerline etchings and set into the asphalt of a service road alongside the runway. "We wanted to make sure all the materials we used were high quality -- black granite, double thickness -- and that it wouldn't fade away," Ciannilli explained. "These should survive whatever activity happens out here." Participating in the project was an honor for Stout, who grew up watching the Space Shuttle Program. "I'm a Brevard County native," Stout said, referring to Kennedy's location on Florida's east coast. "The space program is part of all of our lives here." During the Space Shuttle Program, Ciannilli pointed out, preparations for a flight really began at the end of a shuttle's previous flight -- at the runway, surrounded by convoy teams and vehicles that ensured safety for the crew and the spacecraft. A total of 78 shuttle missions ended successfully with a touchdown on the Shuttle Landing Facility's runway. The new, permanent markers honor and preserve that history. "When people see them, in the future, I hope it inspires them to go back in the history books and learn about the missions," Ciannilli said. "The Space Shuttle Program was an amazing program with a lot of success and a lot of accomplishments. Kennedy Space Center was a huge part of that, and the SLF was a huge part of that."